I was raised reading Greek mythology to explain the progression of the seasons. To this day, I can’t eat a pomegranate without remembering Persephone. But I grew up in California, where “seasons” meant a change of 20º in either direction. Here in the pacific northwest the summer really means something, and the winter is all-consuming. My life is guided by “light” in a way that that I’d never understood before. And for every blissful moment of sundown-at-ten midsummer madness, there’s a difficult, up-before-dawn and wind-in-your-bones winter counterpart. 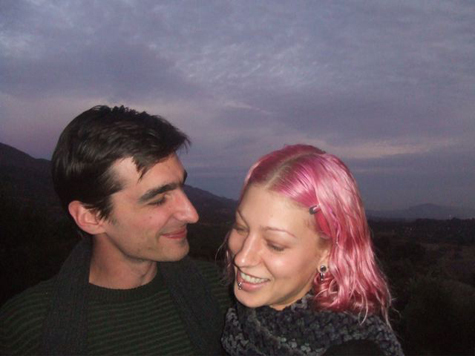 Damian and I celebrating our first Winter Solstice together, circa 2006. Tomorrow, 21 December, is the shortest day of the year. Ever since the Autumn Equinox, the days have been shorter than the nights – and getting shorter, shorter, shorter. Tomorrow marks the height of darkness. The following day the light begins to grow again. The Winter Solstice is celebrated worldwide and across all cultures. We are all tied to the earth and her seasons; we are all affected by light. And this shortest day of the year offers a unique opportunity for reflection. It’s a chance to examine our own relationship with the darknesses of the world. A time to hold space for our own dark thoughts. This is sooooo sweet… My sweetie and I are headed to view the eclipse in a bit. This is our first Winter Solstice together… Here’s to new traditions… love.love.love… woot. I just saw that poem somewhere else..can’t remember where though! Wow…love the hippie upbrining! I was always a bit lonesome in my innate hippie-dom (I tried to practice mindfulness and simplicity as my brother dragged us to the mall!) My parents are still gift-focused…which frustrates me as a true emotional connection with them would mean so much more…but I digress. I love this. Just what I needed. I love this post and poem, too (: And I love that photo of you two – your light pink hair matches with the sky! So pretty. Thanks so much for this post , timely and awesome as usual!You are such an insightful person! I’m living in Berlin Germany at the moment , and am surviving on sunlight from about 9am till 3pm :( its challenging to say the least. your post has made me look at the darkness in a new light! Thank you, Say, for writing about the solstice. I am in tears as I read it, sitting in the dark rainy morning of this short winter day. I love everyone’s comments. I love and ache remembering our solstices. Your post has given me a portal for entering and being with some of my own darkness. Like Kate, “just what I needed”. 21 December is my father’s birthday, and when I was young he would tell me and my siblings about the *summer* solstice festival (Southern hemisphere) held every year on his birthday where he grew up in Peru. The seasonal changes are always pure magic to the kid in me, and I hope to impart that to Nina. Thank you for sharing your story! I love it. Thank you, Sayward. That is such a lovely poem :) Happy winter solstice! I grew up reading that exact same book of Greek myths and remain fascinated by its colorful pictures and intriguing stories to this day. Happy Solstice, Sayward!